and 1 dollar for every pound of coffee sold to the farmers. Freshness and tradition — that’s what Habte Mesfin speaks of while pulling an espresso shot at Revocup, his Overland Park coffeehouse. Talk with him a while longer, though, and the conversation turns to privation and struggle. Mesfin is from Ethiopia, where coffee probably originated and where growing, roasting, brewing and drinking coffee was an essential part of his family’s life. 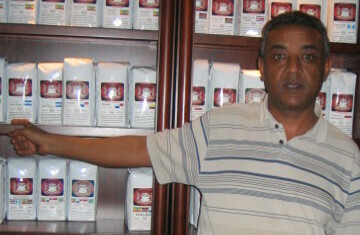 When Mesfin immigrated to the U.S. in the mid-1980s, coffee farmers could still make a living from the bean. That has since changed, Mesfin says. “At least people used to have a decent life. They had their own pride and could feed themselves,” Mesfin says. “Now things are quite different. People are working more, but what they are getting is a lot less.” Read more.